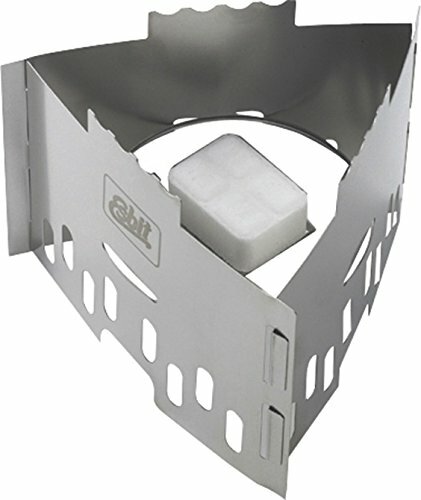 The ultra light and ultra packable stainless steel Folding Pot Stand & Stove includes a tray for an Esbit solid fuel tablet. When put together, it provides a three-sided stable pot stand.The Folding Pot Stand & Stove is versatile so you can remove the tablet tray and snap in an Esbit Alcohol Burner. It's ultralight and very flat when taken apart and placed in the included pouch with belt loop. When disassembled and placed in the included pouch, the pouch will also hold six Esbit solid fuel tablets (not included). Lightweight-stores flat in included mesh bag. Works with Esbit solid fuel tablets or Esbit Alcohol Burner (sold separately).